Art Wynwood, presented by Art Miami, is proud to announce its list of exhibitors, special events and fair highlights for 2017. The five-day fair will return for its sixth edition Presidents Day Weekend, February 16 through February 20, and will showcase iconic works from 20th and 21stcentury artists, and dynamic projects and special installations from sixty international exhibitors. This year’s fair will kick off on Thursday, February 16 with a VIP Preview benefitting Miami City Ballet at The Art Wynwood Pavilion (3001 NE 1st Avenue). The VIP Preview will be sponsored by Christie’s International Real Estate and will display work from the underground street movement, emerging young talent, and world-renowned contemporary and modern artists. The VIP Preview is set to attract prominent collectors, curators and art world luminaries from around the world. This season, Art Wynwood will feature sixty galleries displaying works by more than 500 artists representing almost two dozen countries and thirty-eight cities. · Shepard Fairey, the famous American contemporary street artist, graphic designer, activist, illustrator, entrepreneur and the founder of OBEY Clothing, will be given the Art Wynwood Tony Goldman Lifetime Artistic Achievement Awardthis year. The award acknowledges individuals in art whose careers have changed the industry and is presented in partnership with Wynwood Walls. Most recently, Fairey released the “We the People” series to protest President Donald Trump, featuring portraits of Native Americans, African Americans, Muslims and Latinas depicted with slogans such as “Defend Dignity” and “Protect Each Other.” A selection of these inspiring works will be on display at the fair. February marks Black History Month, and New York City visual artist, Cey Adams, presented by Vertu Fine Art, will display a selection of works from his recent series of American flag paintings, which reveal the rich history and traditions of the African movement in America. The series inspired him to create One Nation, a large-scale mural that he created for a dedication ceremony lead by Barack Obama during Freedom Sounds: A Community Celebration at the opening of the Smithsonian’s National Museum of African American History and Culture. Adams was also the Creative Director of Def Jam Recordings and is known for working with music legends including Beastie Boys, Jay Z and Mary J. Blige, among others. · The Wynwood Radio station once again will broadcast live from the fair, bringing you interviews with artists, exhibitors and fair directors, and streaming the panel discussions for their listeners. · Cuban Art will be a chief focus this year, as Coral Gables Museum has partnered with Art Wynwood to highlight the exhibition Cuban Art in the 20th Century, which features artists Wifredo Lam, Amelia Peláez, Armando Menocal, René Portocarrero, and many others. PUENTE / BRIDGE is a special exhibition that will concentrate on the work of 21st century Cuban artists, the generation that connects us all to this new and exciting time in artistic expression from inside and outside the island nation. Additionally, Luis Valenzuela, Miami visual artist, fashion designer and head of The Creators Lab, will showcase a selection of headpieces inspired by the work of Cuban painter Cundo Bermúdez, as well as display miniature versions on 3D printed models. Live Performances by Artist Trey Speegle from TWYLA in Austin, Texas, will offer fairgoers the chance to paint by numbers with the artist, who will create a large-scale mural that when completed asks the question, “What Kind of World Do You Want?” The American painter and published author will establish a type of visual vocabulary that is ironically ambiguous, drawing inspiration from aspects of pop-culture that parallel Andy Warhol’s pop art style to generate work with its pulse on contemporary society. A Conversation with Shepard Fairey will feature a light and lively discussion with the famed artist hosted by artnet News Associate Editor, Sarah Cascone, who recently highlighted Fairey as one of the top 30 most exciting street artists to watch right now. The Cuban Architects at Home and in Exile: The Modernist Generation will feature a conversation with Victor Deupi, Ph.D., University of Miami School of Architecture, discussing the Modern Cuban House, and Jean-Franḉois Lejeune, Professor of University of Miami School of Architecture, who will address The Modern Cuban City. Cuban Art in the 20th Century–Cultural Identity and the International Avant Gardewill feature a panel discussion with Segundo Fernandez, the curator of the exhibit, Ramón Cernuda, gallerist and supporter of the project, and Juan Martinez, author of the accompanying book. The panel will be moderated by Lyan Fernandez, Chief Operating and Risk Officer of TotalBank. Art Grand Slam Book Signing will give fairgoers the chance to meet tennis star Martina Navratilova and contemporary artist Juro Kralik, as they sign copies of their newest book Art Grand Slam. Opening Night VIP Preview: Thursday, Feb. 16, 6PM – 10PM. Tickets: $25 one-day pass. $55 multi-day pass. Students 12-18 & Seniors 62+ $15. VIP Preview Benefit: $200. 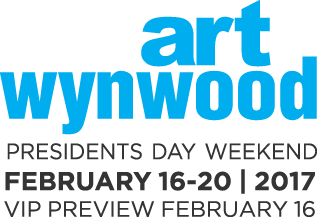 For further information or tickets, please call 1.800.376.5850, email info@artwynwood.com or visit www.artwynwood.com. The generous 2017 sponsors and partners for Art Wynwood include: Christie's International Real Estate, JW Marriott Marquis Miami and Hotel Beaux Arts Miami, db bistro moderne, Goldman Properties, Wynwood Walls, Turon Travel, Bourlet ArtLogistics, Retrovue, Midtown Miami, Spuntino Catering, Miami City Ballet, Coral Gables Museum, Miami Children’s Museum, Pérez Art Museum Miami, ICA Miami, Bass Museum, Luis Valenzuela, MIAMI magazine, Miami Herald, Wynwood Radio, Art Nexus, Art Circuits, Miami New Times, Art Hive, VENÜ , AroundTown Magazine, Uber and the Culture Owl. Art Miami LLC is a partnership consisting of art and media industry veterans Nick Korniloff, Mike Tansey and Brian Tyler. In addition to three fairs during Miami Art Week, Art Miami, CONTEXT Art Miami and Aqua Art Miami, the company annually produces the Palm Beach Modern + Contemporary in January; Art Wynwood during Presidents Day weekend in February; Art New York and CONTEXT New York at Pier 94 in New York in May; Art Southampton in July; and Art Silicon Valley/San Francisco in October.